This afternoon I had a pleasant surprise. For the past week I have been occupied with the installation of the new water feature so I have not paid a lot of attention to the vegetable garden. Last week I noticed some blooms on the squash but didn't expect any big change. What a surprise! Not only had the plants doubled in size but low and behold there was squash for the picking. The largest squash is not edible, but I included it in the picture to demonstrate how quickly things grow when conditions are good. I planted the squash in a bed from last year's experiment in gardening known as "Lasagna Gardening" from Patricia Lanza's book by the same name. This method involves putting down a thick layer of wet newspapers or cardboard to smother any grass and weeds. Next you add a 2-3 inch layer of peat moss to cover the newspaper/cardboard. Then add a 4 to 8 inch layer of organic mulch material over the peat moss. Add another layer of peat moss and another layer of mulch, and so on, until th beds are 18-24 inches high. The mulch can be anything handy like composted manure, compost from the compost pile, or grass clippings. 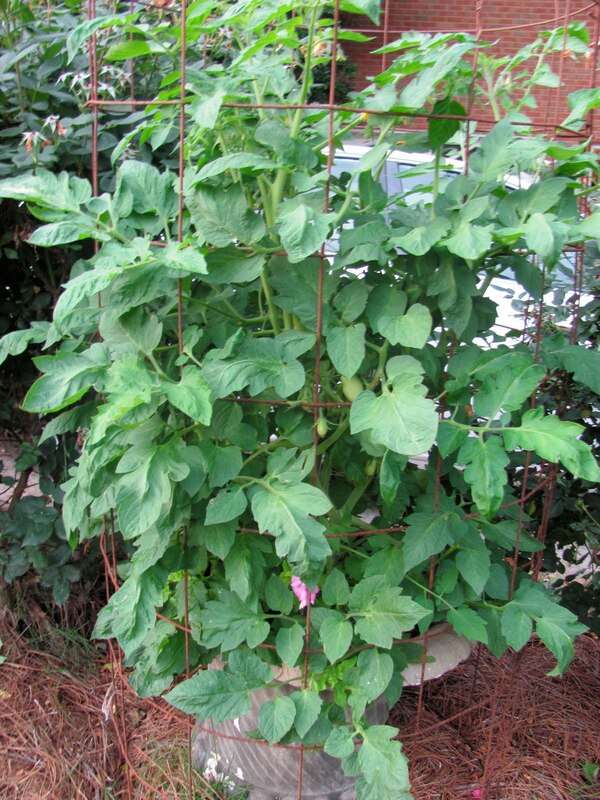 You can also add a scattering of bonemeal and wood ashes to provide extra phosphorus and potassium. This method promises" no digging, no tilling, no weeding, no kidding! "Last year I had limited success and was not particularly impressed with the final results. However, I left the bed intact and decided to give it another try this year. I probably put too many plants in the 4x8 bed but unfortunately I didn't have anywhere else to put them. They looked a little puny after I planted them so I added a little triple 13 fertilizer which with the frequent rains we've had lately seems to have done the trick. I have to admit there was very little weeding to get the bed ready for planting. According to the book you can add additional layers in the fall and let the garden "cook" during the winter and be ready for spring planting. It is also a great time to start or expand new Lasagna gardens. I think that this year's success may be due to the "cooking process" maturing the bed. The rattlesnake pole beans are doing well and have blooms. 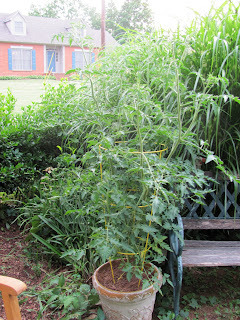 This year's gardening experiment is "potted tomatoes". 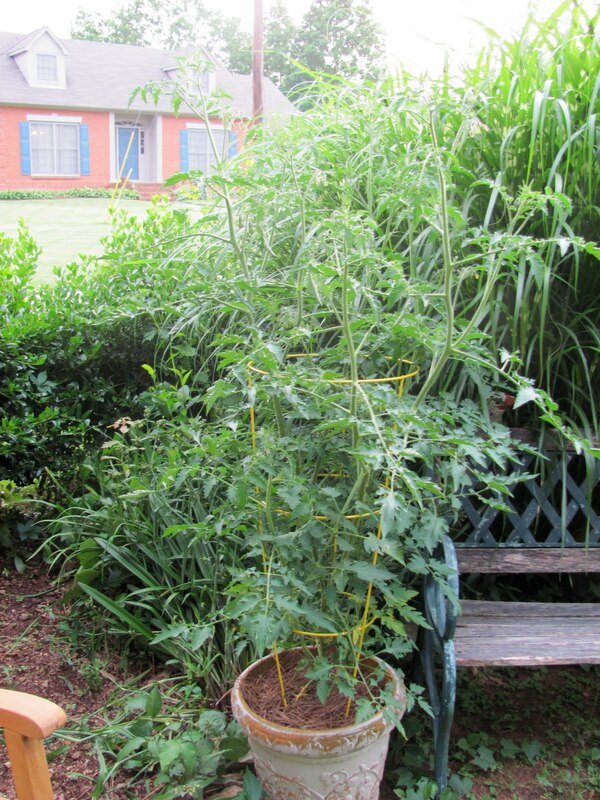 All my tomatoes are planted in large pots . So far they are doing much better than those planted in the conventional manner last year.